The crew is moving fast, trying to keep up with planting, harvesting crops that are ready to pick, packing boxes to take to market and staying ahead of the weeds. We have two markets a week now, and will begin twice-weekly restaurant deliveries before the end of the month. 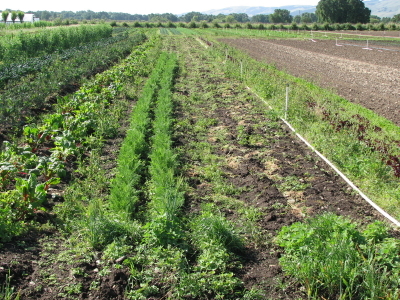 And we are going to begin a CSA beginning June 8th. 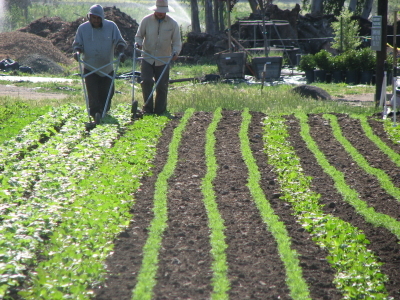 For those of you that don’t know, CSA stands for Community Supported Agriculture. The way it works is subscribers pay a monthly fee to receive a weekly box of produce (and fruit when ready). We are very excited about this program. It is a great way for us to inform a community about what we do through the food we grow, and for us to be more involved with the lives of those that eat our food. 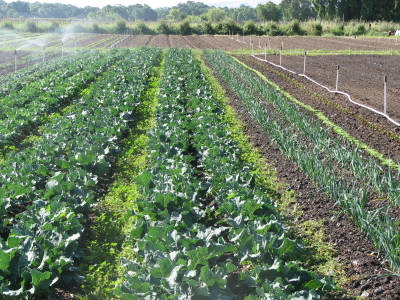 The newsletter that will accompany the box, will help subscribers learn how to use the seasonal bounty we provide, what crops are coming in and what we do on the farm to grow their food. If you are interested in subscribing to the farm, please drop us a line. It will fit beautifully into certain households, especially those that have trouble getting to the market but still want safe, quality produce in their kitchens. 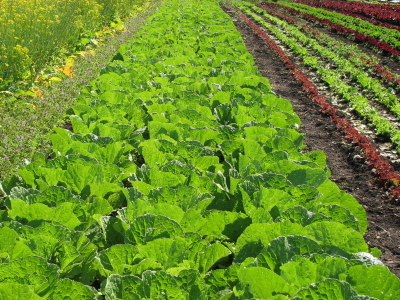 The cabbage crops are unmatched in their beauty. This is napa cabbage and almost ready to cut. The broccoli is beginning to blast. Shouldn't be long before we will see some at the market. Silvano and Austin push wheel-hoes through the turnips. Not the easiest tool, but with practise, these hoes are must faster than a traditional hoe. 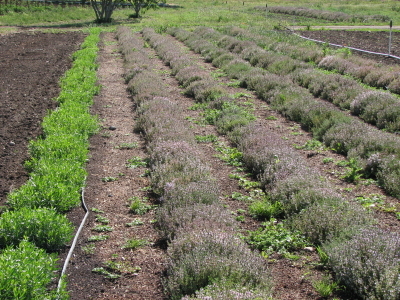 Rows of tarragon and thyme in flower. 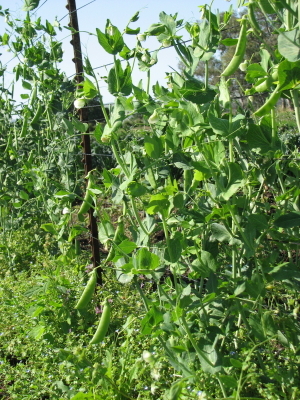 The pea crops are coming in, snap and English. 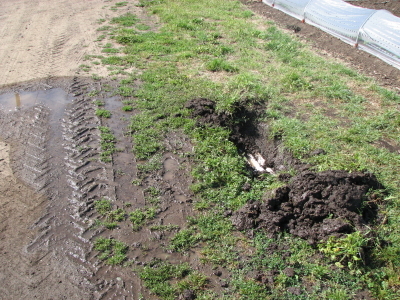 Leaky pipes to fix are a nuisance but constant part of running a farm. There were 6 rows of carrots. And you can see how much remains. Glad there are other plantings that are almost ready. The next lettuce crops look gorgeous. 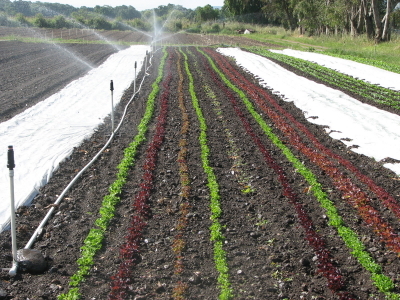 Next to the lettuce are beds of Asian greens and arugula, covered to protect from flea beetle damage. This entry was posted on Sunday, May 22nd, 2011 at 4:30 pm	and tagged with carrots, Crops, farming, lettuce, peas and posted in Uncategorized. You can follow any responses to this entry through the RSS 2.0 feed.